Bright, breezy, frisky and fun, 'Bombay To Goa' [review]  finds Rahul Dev Burman in characteristically fine form. Perhaps not his most adventurous in terms of sonic exuberance (still a lot going on though), it is nonetheless an ace collection of really good songs. It begins wonderfully with the cool psychedelic pop of 'Haaye Haaye Yeh Thanda Paani'. 'Dekha Na Haaye Re' and 'Dil Tera Hai Main Bhi Teri Hoon' are (slightly) more traditional sounding; percussive and infectious. De facto title tune ‘O Maheki Maheki Thandi Hawa’ is a straight-up Hindi version of ‘Help Me Rhonda’. Never my favourite Beach Boys song, however its singalong quality lends itself well to Burman's take and the scene in the film it backs. 'Tum Meri Zindagi Mein Kuch', borrowing elements from Charlie Chaplin’s ‘Limelight’ theme, is a lovely ballad, and 'Title Song' is a typically dramatic instrumental; tense and action packed. 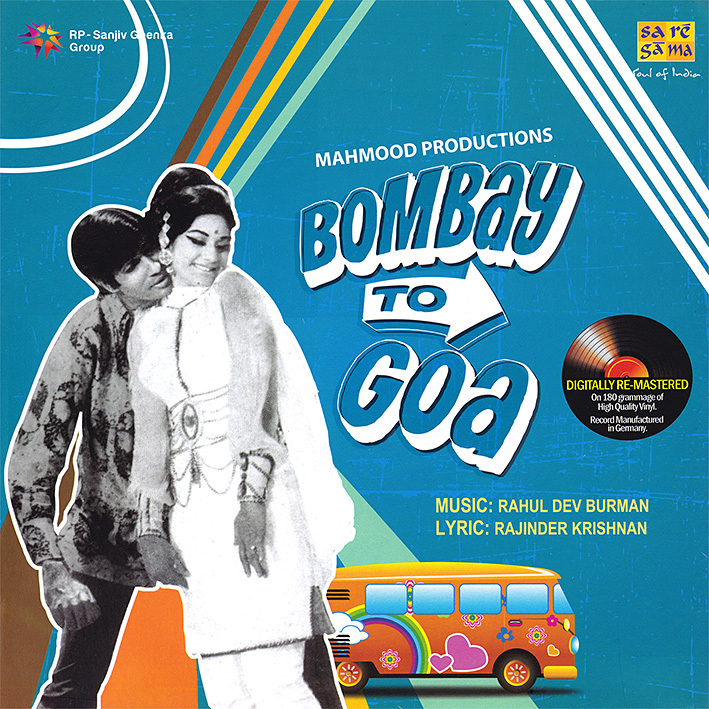 The soundtrack's now perhaps best known track is the English language 'Listen To The Pouring Rain', a medley of international hits sung by Usha Iyer. The story goes that lyrics were altered, marginally, in order to avoid copyright hassle. It seems they got away with it. The film clip is great fun and features Usha herself. To be honest I hadn't actually planned on getting this album. I don't usually look for reissues; however this 2012 release seems to be the first time the soundtrack has been made available in its entirety, at least on vinyl. Funny that, I’ve just been testing them all, and they all lead to the music. But then I realize these are ad-driven sites that require a certain amount of judiciousness before simply clicking the first and best link then subsequently start complaining about not getting immediate gratification. Worked fine for me - Rghost one click to download. Thanks PC. Haven't heard this soundtrack before. I have a few re-issues on vinyl of other soundtracks and I might pick this one up if it sounds like a keeper! Excellent, I appreciate the feedback. Thank you so much PC. Despite being a 180 gm vinyl, the early and first released SPs and EP sound reproduction are way above this LP.. AFAIK "Listen to the Pouring Rain" by Usha Uthhup or Usha Ayer has been released in the vinyl format for the first time. I have not come across any of the SP release with that particular song. Thanks so much for sharing. Just a guess, but I'd imagine Listen to the Pouring Rain not actually being a Burman composition is the reason it didn't appear on any of the original single or EP releases. Please rip and try to upload in FLAC format,Thanks for the upload. Sure thing. Do you want sparkles on it? Served on a golden platter? Number 5 has been all time playlist favorite. Thanks again for such excellent quality. I use ad-blocker and rarely have issues with the links.